The Lockdown Drill teaches students the importance of listening to their teacher and school resource officer during important school drills. 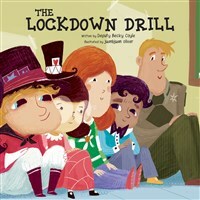 Using fun characters and engaging rhymes, The Lockdown Drill explains safe emergency practices to young children in a non-threatening manner. In her work as an elementary school resource officer, Deputy Becky Coyle learned firsthand how misinformation can affect student performance during emergency procedures and was inspired to create this School Safety series to explain school safety to young children in a fun and engaging way.